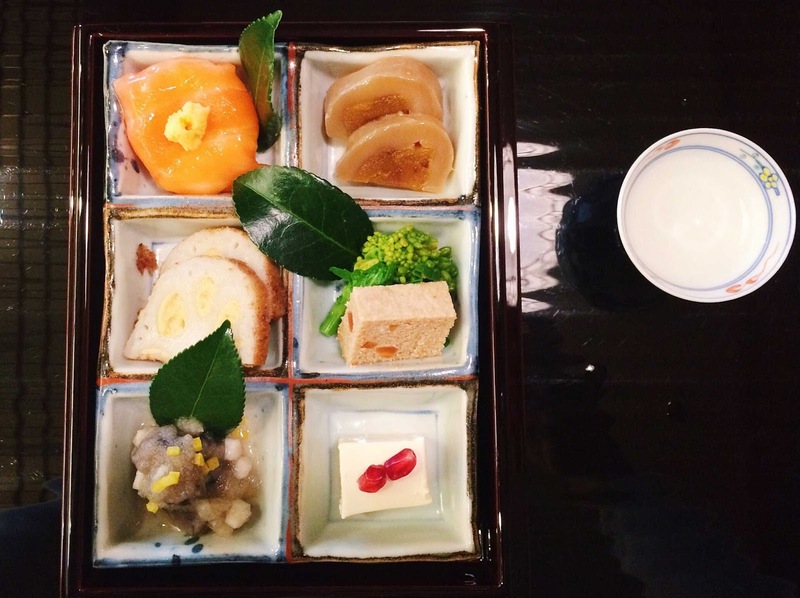 When we started making plans for this trip, a kaiseki lunch or dinner was one of my gastronomical priorities. 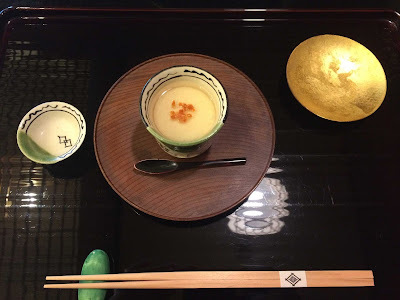 Kyoto is particularly known for its kaiseki restaurants, a considerable number of which have two or three Michelin stars. All kaiseki meals emphasize seasonal ingredients, artistic presentation, and a standardized series of courses, but the restaurants span a broad range of styles from the very traditional to the innovative or modern. We chose Roan Kikunoi for its reputation (two Michelin stars and many recent rave reviews), its balance of traditional and modern style, its moderate price point, and the simple fact that we were able to get a reservation there. 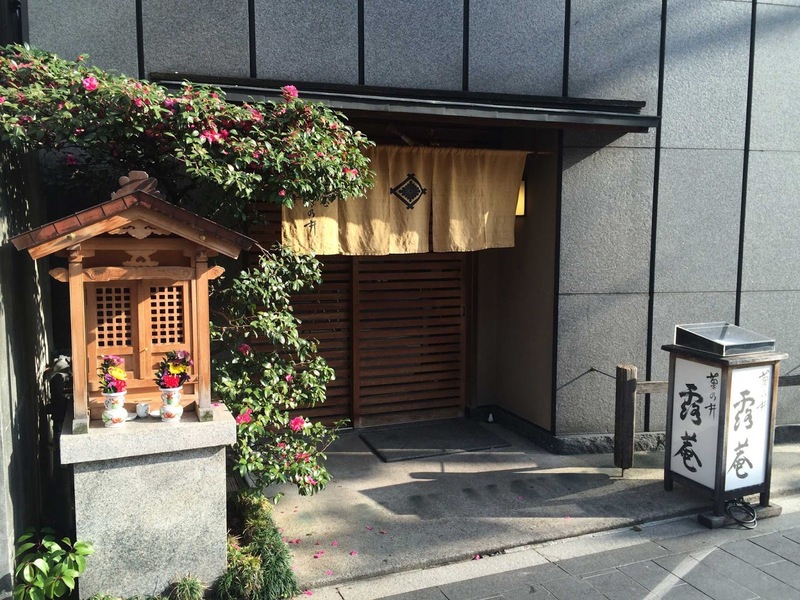 Alternatives we considered were the parent restaurant Kikunoi and Kiyamachi Sakuragawa. Most kaiseki restaurants require that your hotel make the reservation for you, as foreigners can’t book directly. Andrew emailed our hotel a few weeks ahead (in both English and Japanese!) and they readily responded in English. 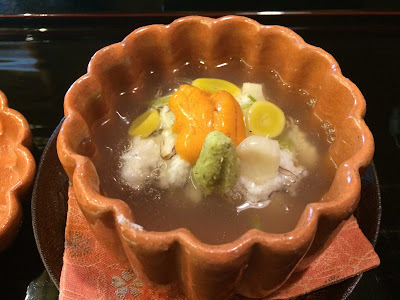 When you request the reservation you also choose your price point from the restaurant’s options, and the restaurant will in turn ask about food allergies: no melon for me and no salmon roe (ikura) for my father. Considerable advance preparation goes into your menu based on your dietary restrictions and the chosen price point, which determines the number of courses and whether any rare or expensive ingredients are used. 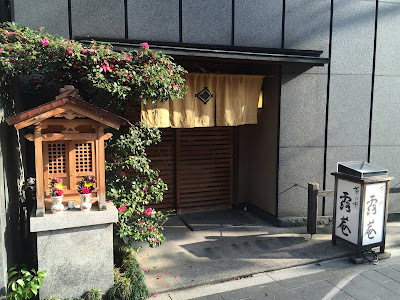 The exterior of Roan Kikunoi is elegant but unassuming, facing a narrow street and a small canal, and our table was ready five minutes early. The table was set with attractively printed menus in both English and Japanese, a welcome guide and souvenir for this adventure. Two impeccable servers took care of our table and both of them spoke some English. New utensils and dishware were arranged meticulously in front of us for each course, including beautiful ceramics and lacquer pieces, then removed with equal poise. The first course was an "aperitif" of sake with yuzu fragrance, presented in tiny iridescent lacquered bowls that I forgot to photograph. Amuse bouche: Yuba (tofu skin) with pickled and dried sea cucumber. The gold round at right is the upturned lid for the vessel. Appetizers (clockwise from top left): Smoked salmon with camellia flower, grey mullet roe rolled in squid, cod roe terrine with broccoli rabe, miso-marinated tofu with pomegranate seeds, sea cucumber and turnip, and lotus root stuffed with fresh mustard. This was one of the most memorable courses for the stunning clarity of flavors and how they played off of each other, such as the sharpness of mustard blanketed by the crisp sweetness of the lotus root. 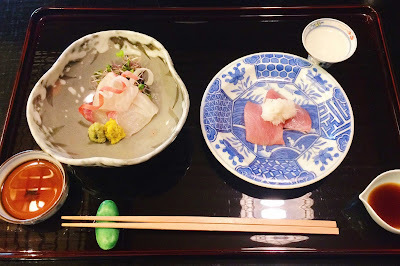 Sashimi: Tai (red sea bream) with chrysanthemum petals and fresh wasabi, buri (amberjack) with Kyoto local radish. Such fresh fish! The sea bream was translucent and seductively smooth. Steamed dish: Guji (red tilefish) steamed with grated turnip, wood ear mushroom, lily bulb, Mitsuba (Japanese parsley), fresh uni (sea urchin) scallop, gingko nuts, wasabi. It looked like the serving vessels were individually steamed after the ingredients were carefully assembled, since they fell apart with a light touch of the spoon. 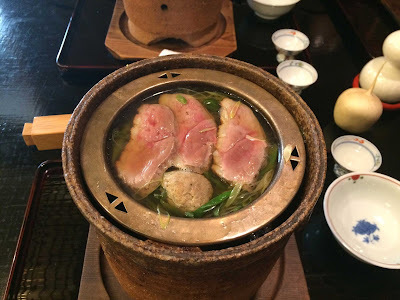 Hot pot: Duck breast, duck meatballs, Sansho pepper, and green onion in a savory-sweet broth. Rich but also clean-tasting. Rice with ikura and Kintoki carrot (a red Japanese varietal) soup, served with pickles and tea. 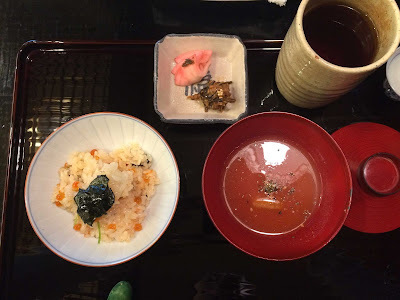 For my father, the salmon roe in the rice was replaced with carrot. Needless to say, the rice was perfectly cooked and seasoned. Elegant simplicity. There was plenty more rice left in the cooking vessel, so the server formed the leftovers into onigiri (rice balls) for us to take away. 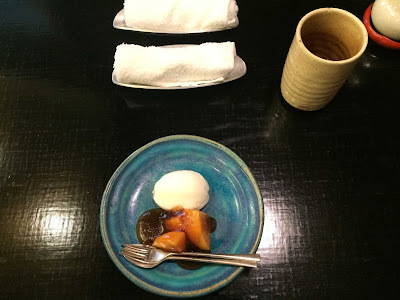 Dessert of persimmon with yuzu sorbet and tea jelly. After we finished luxuriating over this meal and paid the bill, head chef Yoshihiro Murata himself came out and thanked us. We told him what a spectacular meal this was, thanked him, and were graciously bowed out of the restaurant. It has been over seven months, but I still remember the harmonious flavors and textures, as well as the beautiful presentations. This was absolutely a bucket-list experience and I'm so glad my parents, Andrew and I got to experience it together.